American engineer mission specialist astronaut 1998-2010. Status: Inactive; Active 1998-2010. Born: 1965-05-25. Spaceflights: 2 . Total time in space: 27.71 days. Birth Place: North Hollywood, California. Grew up in El Paso, Texas.. Educated Texas-El Paso; Houston; Rice. PERSONAL DATA: Born in North Hollywood, California, 1966, and raised in El Paso, Texas. Married to the former Marie Schwarzkopf, also from El Paso, Texas. They have 5 children. Recreational interests include running, weightlifting, hunting, fishing and surfing. EDUCATION: Graduate of Burges High School, El Paso, Texas; received a bachelor of science degree in mechanical engineering from the University of Texas-El Paso; a masters of science degree in mechanical engineering from the University of Houston and a doctorate in mechanical engineering and materials science from Rice University. AWARDS: Six U.S. Patents; Four NASA Class One Tech Brief Awards; Five JPL-California Institute of Technology Novel Technology Recognitions; The University of Texas-El Paso Distinguished Alumnus, HENAAC Most Promising Engineer, McDonald’s Hispanos Triunfadores Life Time Achievement Award, NASA ASEE Summer Faculty Fellowship Award, Dow Life Saving Award. EXPERIENCE: After graduating with his undergraduate degree, Olivas worked for the Dow Chemical Company as a mechanical/materials engineer responsible for performing equipment stress/failure analysis for the operating facilities. Upon completing his master's degree, Olivas pursued his doctorate while supporting engine coating evaluations for C-5 maintenance operations at Kelly Air Force Base. He also supported the Crew and Thermal Systems Directorate at NASA Johnson Space Center, evaluating materials for application to the next generation space suits. Upon completing his doctorate, he received a senior research engineer position at the Jet Propulsion Laboratory (JPL) and worked in the development of tools and methodologies for nondestructively evaluating microelectronics and structural materials subjected to space environments. He was promoted to Program Manager of the JPL Advanced Interconnect and Manufacturing Assurance Program, aimed at evaluating the reliability and susceptibility of state-of-the-art microelectronics for use in future NASA projects. Throughout his career, he has authored and presented numerous papers at technical conferences and in scientific journals. NASA EXPERIENCE: NASA selected Olivas in 1998. Astronaut Training included orientation briefings and tours, numerous scientific and technical briefings, intensive instruction in Shuttle and International Space Station systems, physiological training and ground school to prepare for T-38 flight training, as well as learning water and wilderness survival techniques. From 1999 to 2002, he was assigned technical responsibilities within the Robotics Branch as lead for the Special Purpose Dexterous Manipulator Robot and the Mobile Transporter. From 2002 to 2005 he was assigned to the EVA Branch and supported the research effort focused on developing materials, tools and techniques to perform on-orbit shuttle repair. In 2006, he served as lead of the Hardware Integration Section of the Space Station Branch, responsible for ensuring proper configuration and integration of future station modules and visiting vehicles. In 2007 he flew on STS-117 logging 336 hours in space including over 14 EVA hours. In 2008 he was assigned to the Capsule Communicator (CAPCOM) Branch that is responsible for all interface with the flight control team at Mission Control in Houston and the on-orbit STS and ISS crews. In 2009 he served aboard STS-128 and has a cumulative total of over 668 hours in space and over 34 EVA hours. 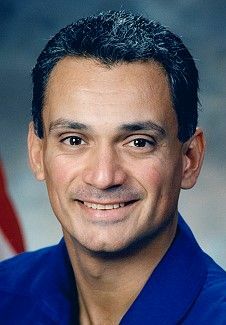 Olivas retired from NASA on May 25, 2010. SPACE FLIGHT EXPERIENCE: STS-117 Atlantis (June 8-22, 2007) was the 118th Shuttle mission and the 21st mission to visit the International Space Station, delivering the second starboard truss segment, the third set of U.S. solar arrays, batteries and associated equipment. The mission also entailed the first ever on-orbit EVA repair to the Space Shuttle, Atlantis. During two spacewalks, Olivas accumulated 14 hours and 13 mins of EVA experience. The mission also delivered and returned with an expedition crew member. STS-117 returned to land at Edwards Air Force Base, California, having traveled more than 5.8 million miles in 13-day, 20 hours and 20 minutes. STS-128 Discovery (August 28 to September 11, 2009) was the 128th Shuttle mission and the 30th mission to the International Space Station. While at the orbital outpost, the STS-128 crew rotated an expedition crewmember, attached the Leonardo Multi-Purpose Logistics Module (MPLM), and transferred over 18,000 pounds of supplies and equipment to the station. During three spacewalks,Olivas accumulated 20 hours and 15 mins of EVA experience. The STS-128 mission was accomplished in 217 orbits of the Earth, traveling over 5.7 million miles in 332 hours and 53 minutes and returned to land at Edwards Air Force Base, California. Born May 25, 1966 in North Hollywood, California, but considers El Paso, Texas to be his hometown. Married to the former Marie K. Schwarzkopf, also of El Paso, Texas. They have 3 children. Recreational interests include running, weightlifting, hunting, fishing, surfing, and mountain biking. His parents, Juan and Carmen Olivas, reside in El Paso, Texas. Her parents, Donald and Dorothy Schwarzkopf also reside in El Paso, Texas. Graduated from Burges High School, El Paso, Texas, in 1984, received a bachelor of science degree in mechanical engineering from the University of Texas-El Paso in 1989, a masters of science degree in mechanical engineering from the University of Houston in 1993 and a doctorate in mechanical engineering and materials science from Rice University in 1996. American Society of Materials International (ASM International), Texas Registered Professional Engineer, Sigma Chi Fraternity. Four NASA Class One Tech Brief Awards (1997 and 1998), Five JPL-California Institute of Technology Novel Technology Report Recognitions (1997 and 1998) Pan American Institute Scholarship Award (1995), NASA ASEE Summer Faculty Fellowship Award (1995), Rice University Scholarship (1994), Dow Life Saving Award (1992). After graduating in 1989, Olivas worked until 1994 for the Texas Operations Division of the Dow Chemical Company in Freeport, Texas. While there, he was a mechanical/materials engineer responsible for performing equipment stress/failure analysis for over 80 operating facilities. After completing his masters degree in 1993, Olivas pursued his doctorate while supporting engine coating evaluations for C-5 maintenance operations at Kelly Air Force Base. In the Summer of 1995, he worked as a Summer Faculty Fellow for the Crew and Thermal Systems Directorate at NASA-Johnson Space Center, evaluating materials for application to the next generation Extravehicular Mobility Unit. Upon completing his doctorate, in the Spring of 1996, he moved to Los Angeles, California, to join an aerospace materials consulting firm. In the Fall, Olivas was offered a senior research engineer position at the Jet Propulsion Laboratory (JPL), Quality Assurance Section, in Pasadena, California. His research included the development of tools and methodologies for nondestructively evaluating microelectronics and structural materials subjected to space environments. Shortly after, he was promoted to Program Element Manager of the JPL Advanced Interconnect and Manufacturing Assurance Program. This NASA sponsored research effort included scientific investigations aimed at evaluating the reliability and susceptibility of state-of-the-art microelectronics for use in future NASA projects. Additionally, he was the JPL lead for the NASA Safety Reliability and Quality Assurance Nondestructive Evaluation (NDE) program and was the sole NASA representative investigating applications of NDE to microelectronics applications. Through his career, he has authored and presented numerous papers at technical conferences and in scientific journals and is principal developer of seven inventions. Selected by NASA in June 1998, he reported for training in August 1998. Astronaut Candidate Training includes orientation briefings and tours, numerous scientific and technical briefings, intensive instruction in Shuttle and International Space Station systems, physiological training and ground school to prepare for T-38 flight training, as well as learning water and wilderness survival techniques. Following a period of training and evaluation, Olivas will receive technical assignments within the Astronaut Office before being assigned to a space flight. Family: Astronaut. Country: USA. Spacecraft: ISS. Flights: STS-117, STS-128. Bibliography: 12, 5849. 1965 May 25 - . Birth of John Daniel 'Danny' Olivas - . Nation: USA. Related Persons: Olivas. American engineer mission specialist astronaut 1998-2010. 2 spaceflights, 27.7 days in space. Flew to orbit on STS-117 (2007), STS-128..
2007 June 12 - . 20:02 GMT - . EVA STS-117-1 - . Crew: Olivas, Reilly. EVA Duration: 0.26 days. Nation: USA. Related Persons: Olivas, Reilly. Program: ISS. Flight: Soyuz TMA-10, STS-117, STS-117 ISS EO-15. The crew connected power, data and cooling cables between the S1 and S3 trusses; deployed the four solar array blanket boxes on S4; released the photovoltaic radiator on S4; rotated the keel pin on S3; modified the Solar Alpha Rotary Joint; and removed SARJ launch locks. STS-117 MCC Status Report #13 - . Nation: USA. Related Persons: Archambault, Olivas, Reilly, Sturckow, Williams. Program: ISS. Flight: Soyuz TMA-10, STS-117, STS-117 ISS EO-15. 2007 June 16 - . 17:24 GMT - . EVA STS-117-3 - . Crew: Olivas, Reilly. EVA Duration: 0.33 days. Nation: USA. Related Persons: Olivas, Reilly. Program: ISS. Flight: Soyuz TMA-10, STS-117, STS-117 ISS EO-15. Olivas spent the first two hours stapling down loose re-entry thermal insulation on Atlantis' orbital maneuvering system pod. Reilly meanwhile installed the hydrogen vent valve of a new oxygen generation system on the Destiny laboratory. They then worked together on the wearisome task of folding an old solar array on the station in preparation for its move to another location on the station later in the year. 2007 June 20 - . 2009 September 1 - . EVA STS-128-1 - . Crew: Olivas, Stott. EVA Duration: 0.27 days. Nation: USA. Program: ISS. Flight: Soyuz TMA-14, Soyuz TMA-15, STS-128. The crew exited at 21:48 and retrieved the EUTEF and MISSE 6 experiments from the Columbus module. The hatch was closed at 04:19 GMT..
2009 September 3 - . EVA STS-128-2 - . Crew: Fuglesang, Olivas. EVA Duration: 0.28 days. Nation: USA. Program: ISS. Flight: Soyuz TMA-14, Soyuz TMA-15, STS-128. The crew exited at 22:09 and replaced an ammonia tank assembly on the P1 truss. The hatch was closed at 04:45 GMT..
EVA STS-128-3 - . Crew: Fuglesang, Olivas. EVA Duration: 0.29 days. Nation: USA. Program: ISS. Flight: Soyuz TMA-14, Soyuz TMA-15, STS-128. The crew exited at 20:38 and deployed the S3 payload attach system. The hatch was closed at 03:34 GMT..